BACK FROM THE DEAD (renamed BACK to P2GoogleVoice)!! This FREE unofficial Google Voice communications service application does all the work for you when you want to place a phone call or send a text. A simple one time only setup with your Google Voice™ communications service number, PIN and email credentials and you're good to go. 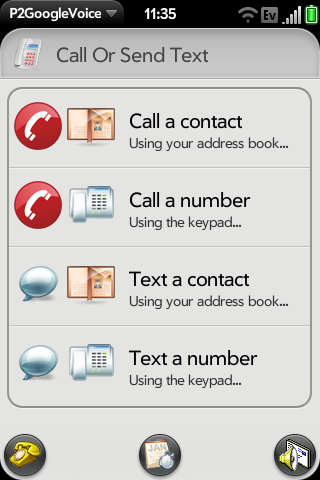 From now on, just select any contact in your address book or use the built-in dial pad. Your Palm's phone will have all your numbers and commands 'pushed' in ready for you to just tap and talk. Recipients will only see your Google Voice™ communications service number - even for text messages.